Tilted Horizons: Today in History: PAC-MAN is born! Today in History: PAC-MAN is born! 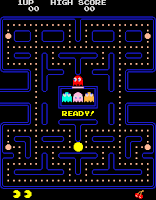 October 10, 1979: "Pac-Man" debuts in Japan. Actually, it's called Puck-Man after the Japanese onomatopoeic phrase paku-paku that represents the sound of a mouth rapidly opening and closing. The name is changed to Pac-Man for release into the U.S. market out of fear of what any red-blooded American male teenage would do with an eraser, piece of tape or sharp-edged object. Designed for Namco by Toru Iwatani, Pac-Man consumed quarters (mine anyway) almost as fast he gulped up dots, fruit and the occasional ghost.